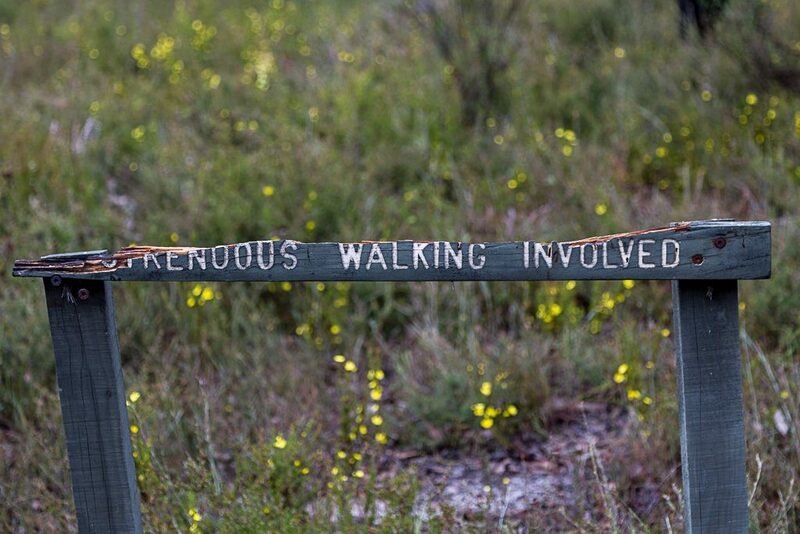 When it comes to hiking, I have a simple mantra. ‘Slept in. Late to start.’ Sure, as a saying, it’s unlikely to feature on any motivational posters, but it’s better than some of my other inspiring lines. How about these? ‘The road ahead is easier when tanked’ or ‘A vista is better with sugar’. As you can see, they’re not great, but considering I made them up 0.7 seconds ago, they aren’t too bad. 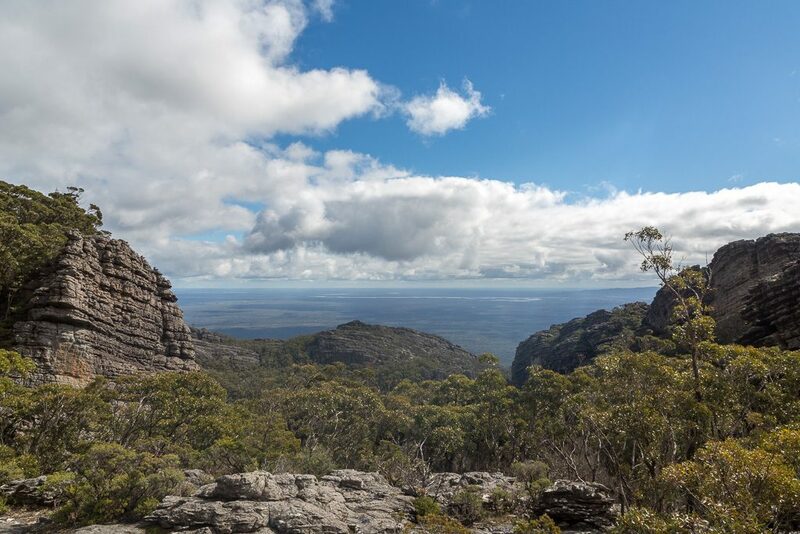 The Fortress circuit is traditionally a three day walk and opening leg from Harrop Track to the Fortress, Grampians National Park would be the hardest. Remember, it was technically still winter, so there wasn’t a lot of daylight on offer, so I couldn’t adhere to my sleeping mantra. Luckily though, I had a secret weapon up my pyjama sleeves in order to create an early start. I’d given up all medication. Let me bore you with the details. Those looking for the stuff about the hike (what?!) then feel free to skip the next few paragraphs. 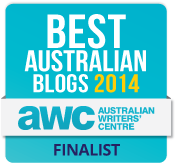 The long suffering reader of this blog might recall my adherence to pharmaceuticals. Well, until about three months ago when I gave up the lot. For a while, I’d had a gutful of Pristiq and wondered how to get off them. I spoke to my doctor and he offered an alternative. Essentially, it was stop, take Valium and then begin another anti-depressant. Little did he know he was dealing with someone who prefers to sail too close to the wind. My method isn’t for everyone, as I went cold turkey. If you ever Google, ‘how do I get off Pristiq’, you’ll find pages of information from punters who just can’t kick that particular drug. I figured if I was sitting at home, then adhering to the abrupt cessation would be too hard. A more novel approach was needed. I’d give up all the pills, but instead of being on a couch, I’d do it on a week long hike. So, the week before the Fortress circuit, I wandered the Great Ocean Walk. Upon reflection, the memory is a little hazy, as the brain was having a serious meltdown all week. I really should write a post called, ‘How I beat Pristiq’, as it will be read by way more people than these walking ones. It really is a tricky drug to kick. This is all good, but what does it have to do with this walk? Well, it took place during week two of ‘Piss off Pristiq’, so mentally I was all over the place. It wasn’t all bad though, as my sleep was haywire. Remember the mantra? That was no longer. I could barely put four hours of nap-time together, which meant the day of this hike, I was well and truly awake by 4.30 am. Maybe it was the anticipation of knowing that in a few hours time, I’d be having my lungs torn asunder during the opening uphill slog? I’ve no idea, but there was so much energy flowing, I had no regard for the traditional method of getting out of bed. You know, swinging the legs to the side and standing up? No, I was way too juiced, so whilst lying flat on my back, I lifted my legs vertically above my head and then flung them forwards. This caused a ballistic vault, where my legs cleared the end of the bed by metres and I landed perfectly upright on both feet. It was an amazing scene, which was straight out of the ninja handbook. Except this was a local version. More like an Obeseja. The previous evening, I’d packed the car, so all I had to do was inhale some porridge and hit the road. I’ve no idea what time I began driving, but I do know it was still dark. Oh, if anyone in western Victoria was awoken by a loud boom, don’t panic, as it was just me as I broke the sound barrier. In fact, progress was made so quickly, at 7.05 am I hit Dunkeld and took my first photo of the day. 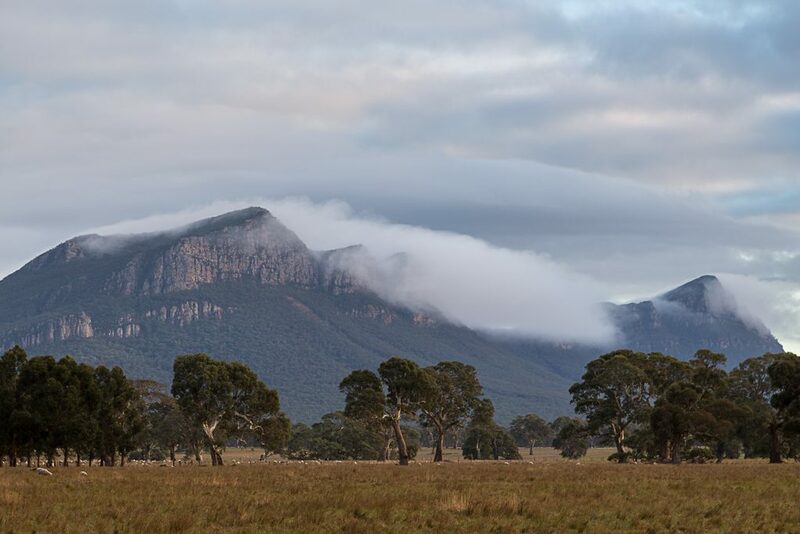 Low cloud was swirling around Mt Abrupt, so I thought it was worthy of a picture. Unfortunately Signal Peak is in the same image. 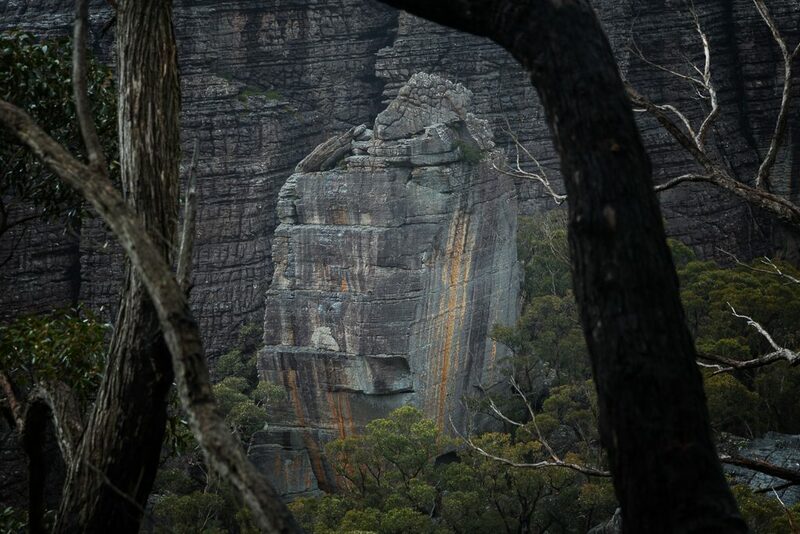 After a tilt on that peak last year, just the memory of it is enough to kick in some Grampians PTSD. Generally I’ve got no idea about a lot of things, but one really stands out from the rest of the ‘haven’t got a clue’. 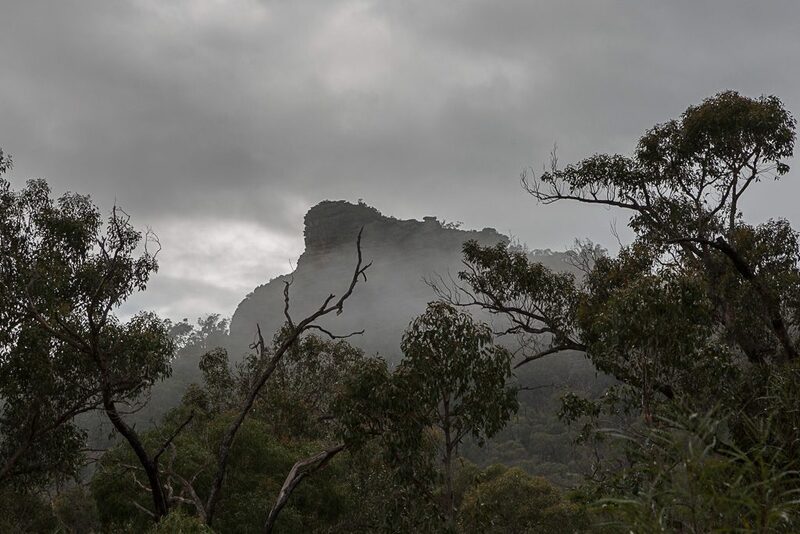 It’s the Grampians weather. My trips regularly deliver something completely different to the forecast. The most notable occasion was way back on the Mt Difficult hike. 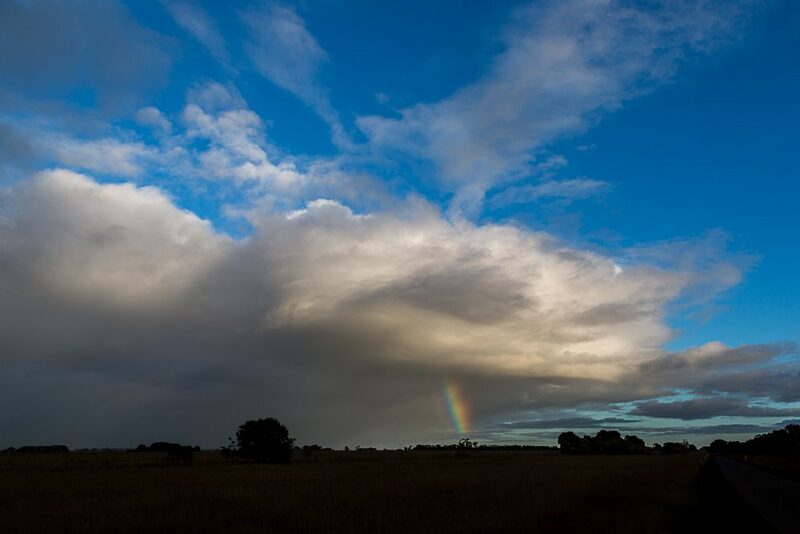 A forecast of ‘showers’ was actually code for ‘continuous heavy rain for 8 hours’. As I drove on from Dunkeld, I was sensing a familiar feeling. Heavy rain was nearby, so I didn’t really know what to expect once the walking commmenced. 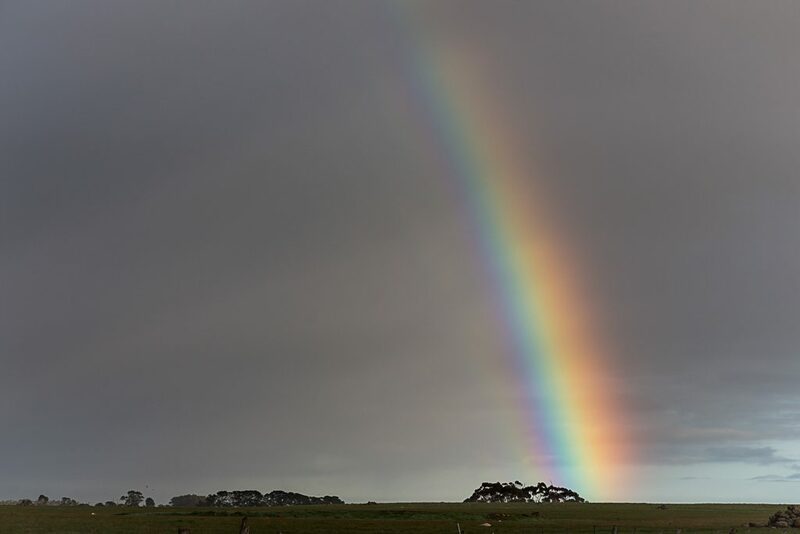 It did make for a nice rainbow though. Potentially, it felt like I might be in for a day of passing showers. That was until I turned onto Billywing Road. Instead of passing clouds, it was a classic pea-souper. 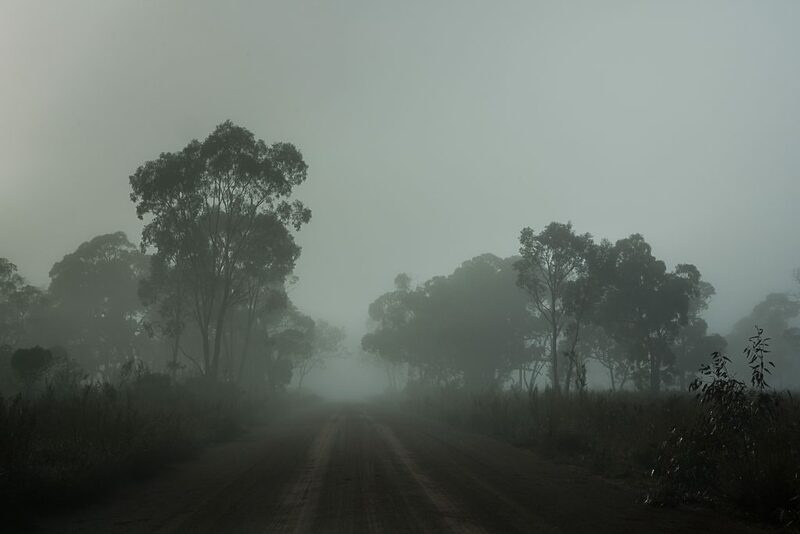 The drive on the gravel was slow, as the occasional kangaroo would leap out of the mist. A new bonnet ornament was the last thing I needed, so I crawled the remaining distance to the Harrop Track carpark. Oh, one other thing. Is it ‘Harrop’ or ‘Harrops’? As is the way in these places, no one seems to know. Google maps has it as ‘Harrops’, but all my maps and Parks Vic list it without the ‘s’. Mm… I’m going to stick with the map for the time being. Actually, this is a good time to mention the maps. In the previous post, I mentioned I’d lost the plot by taking an excessive amount of track notes. How bad was it? Here, I’ll show you a list of what I was carrying. 1. 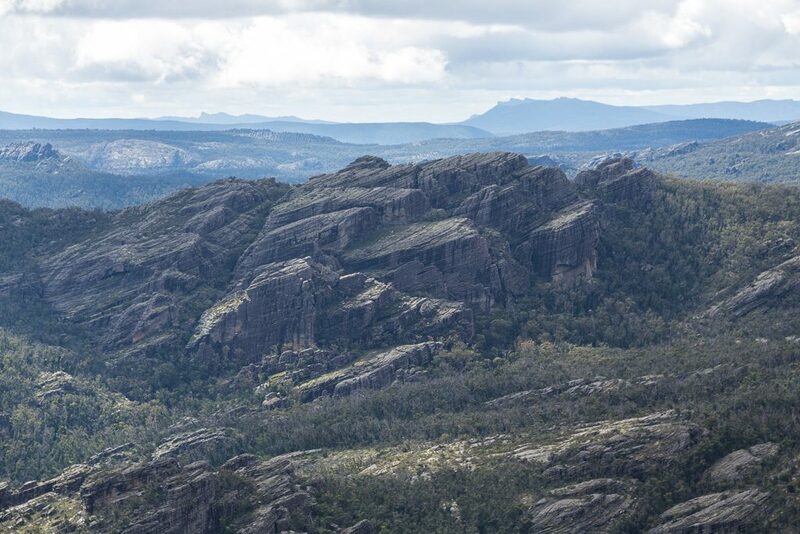 Spatial Visions 1:50,000 Southern Grampians map. 2. 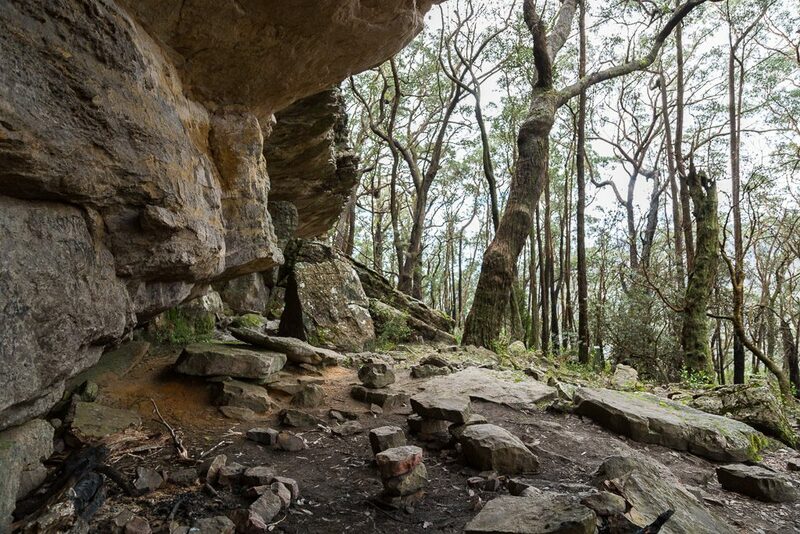 Notes for ‘The Fortress’, from John Chapman’s Bushwalking in Australia. 3. 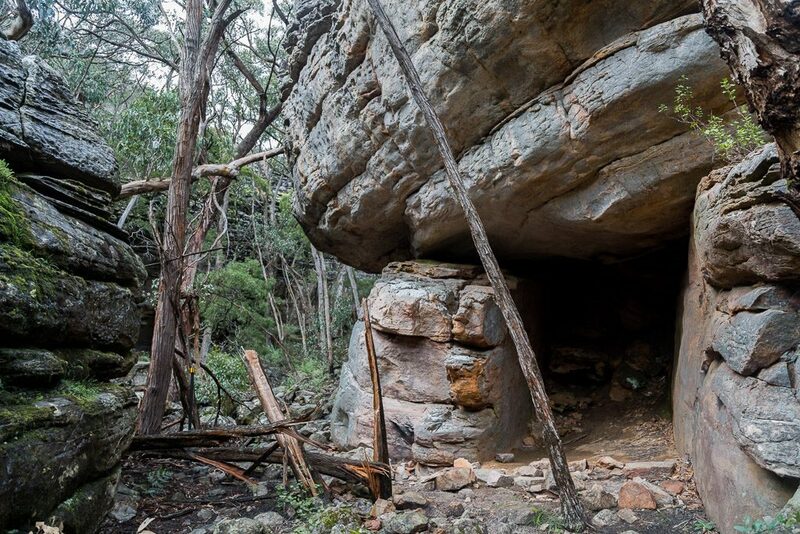 Note for ‘The Fortress Caves’, from Glenn Tempest’s, Daywalks Around Victoria, plus a loaded gpx from his website. 4. 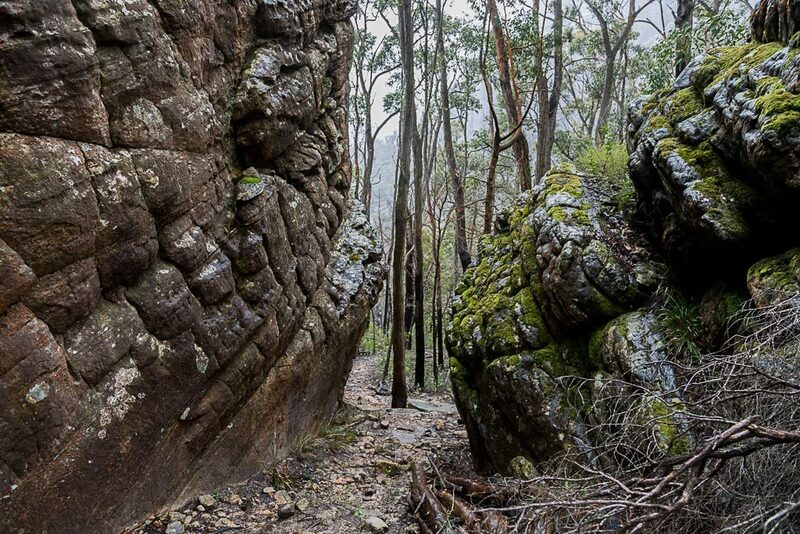 Parks Vic – The Fortress and Mt Thackeray. 5. Vic Map 1:30,000 topographic map no. 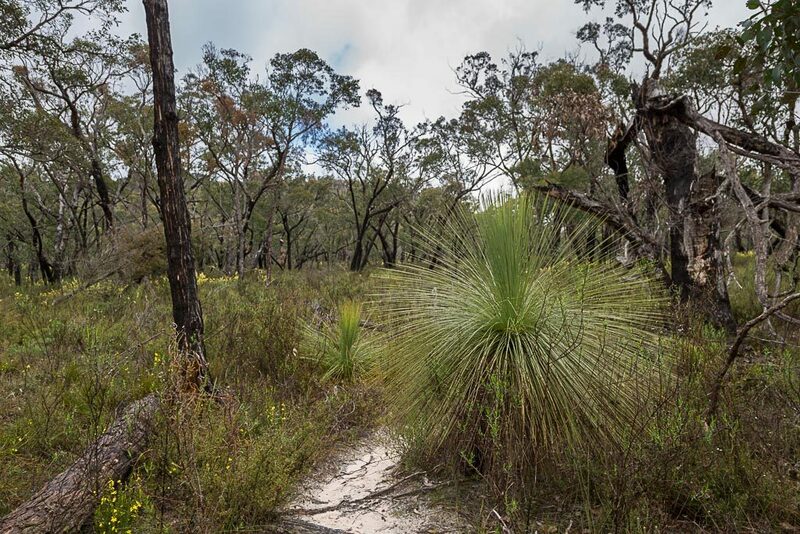 T7323-2-4-N, which I obtained from my go-to Grampians Guru, Craig Tyers. Isn’t it funny how some people use his information word for word, not to mention the gpx files and don’t even acknowledge the bloke? Mm… Is that it? Yeah, I think so. Oh, plus the trip intentions form I had to fill out from the Brambuk National Park and Cultural Centre. As you can see, it was little insane, but as I kept finding things that may be of use, I continued to throw them in the pack. Besides food, my main pack weight was paper. At least no one could accuse me of being under-prepared. Anyway, after a million failed attempts, I finally parked the car on Harrop Track and was ready to go. At the time though, I’m not sure if anticipation of the day ahead is the right word? The next six hours would consist of walking uphill within variable weather, so I think trepidation would be a more accurate description of how I felt. The sign at the start lists the distance as, ‘Fortress – 4.6 km’. That’s certainly a short day, but I was pretty confident it was only the distance to the Deep Creek hiker campsite. My intentions were to continue past and make it to the Fortress Camp, which was a few kilometres further. …and the ‘off-set branch against a colourless background’. All good photographic options. At this stage, it was still level walking, but that was about to change. 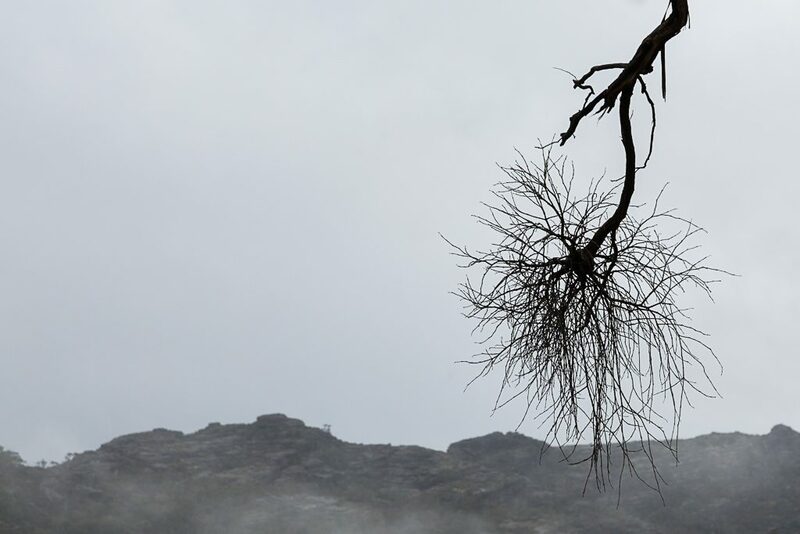 A sign that had being chewed on by hikers driven insane was an indication of what was to come. ‘Uous Walking Involved’. …the climbing officially began. And I fell over. I’m not sure what happened, but I think I tripped on a twig. One minute I was upright and the next I was lying on my back. I know what you’re thinking. My left leg has been torn off by the tumble? This isn’t the case though. It’s not in the photo, as at the time, the heel of my left boot was resting against the back of my head. Then again, I may have been harsh on myself, as nearby there was evidence that someone else had tumbled. They’d even lost the lid from the latte they were carrying at the time. From the tumbling photo, the savvy reader will have noticed that I was wearing a pair of Merrell Moab Ventilator boots. 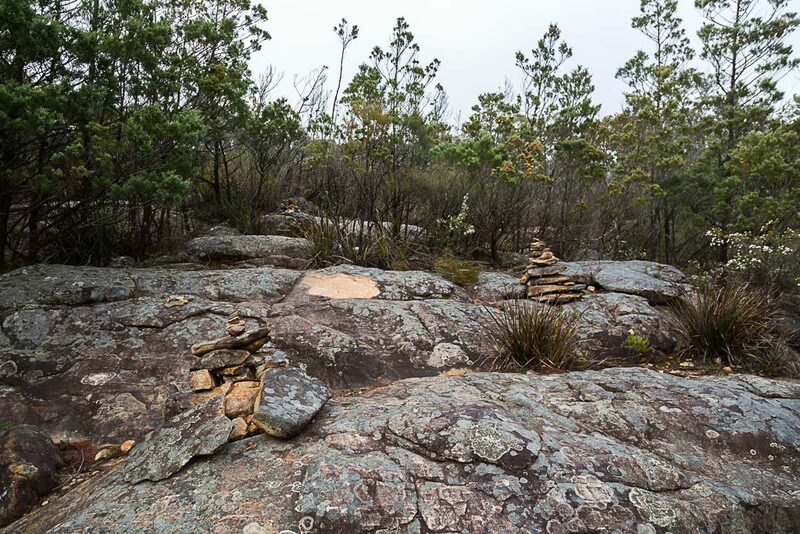 These had a part to play, as I began to follow some cairn marked rocks. 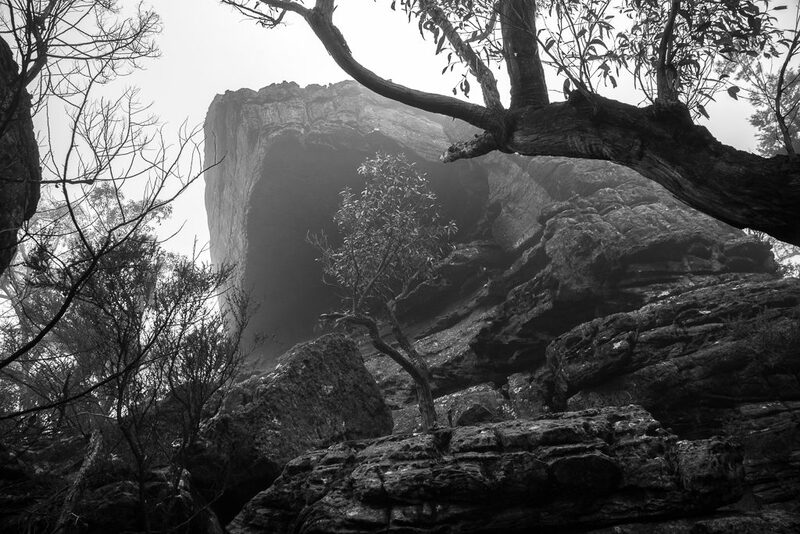 The wintry weather meant that everything around me was wet and wandering across rocks became precarious. The Merrell’s Vibram sole is great when the conditions are dry. If the surface is damp though, their adherence is similar to wearing a cake of soap that’s been dipped in lard. 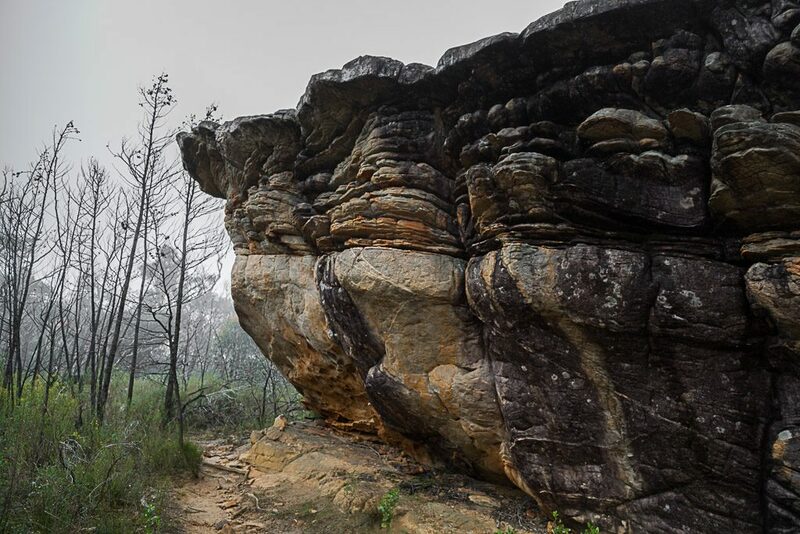 This was problematic, as I knew there were spots where I could leave the track and clamber up some rocks in order to get a panoramic view of the area. At one point, I found a likely area. 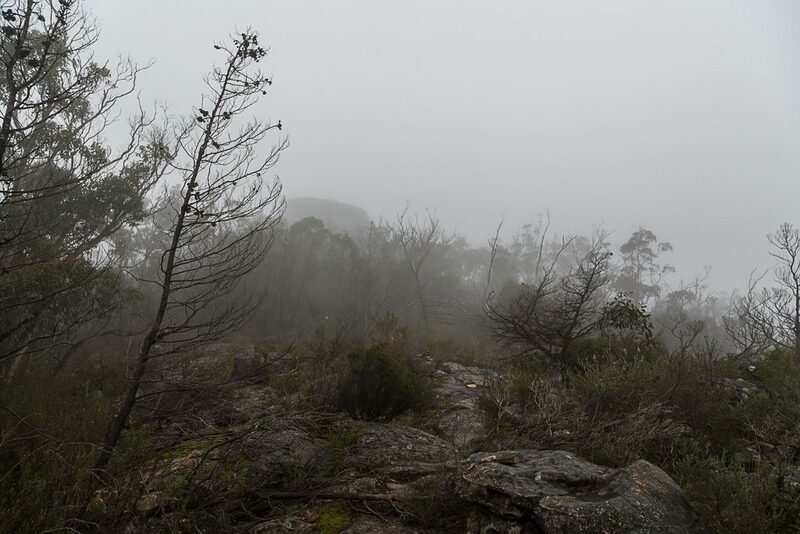 Visibility began to improve, so I dropped the pack and began to climb. 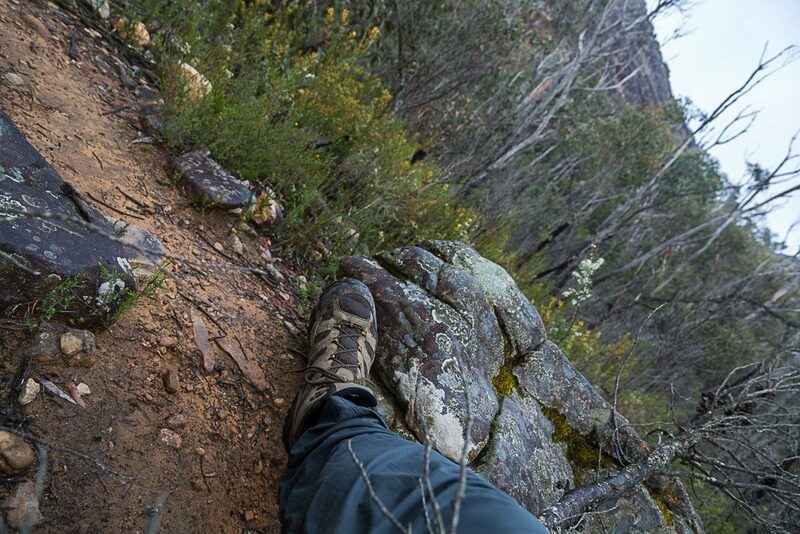 It was a struggle though, as my boots refused to grip onto the rocky surface. 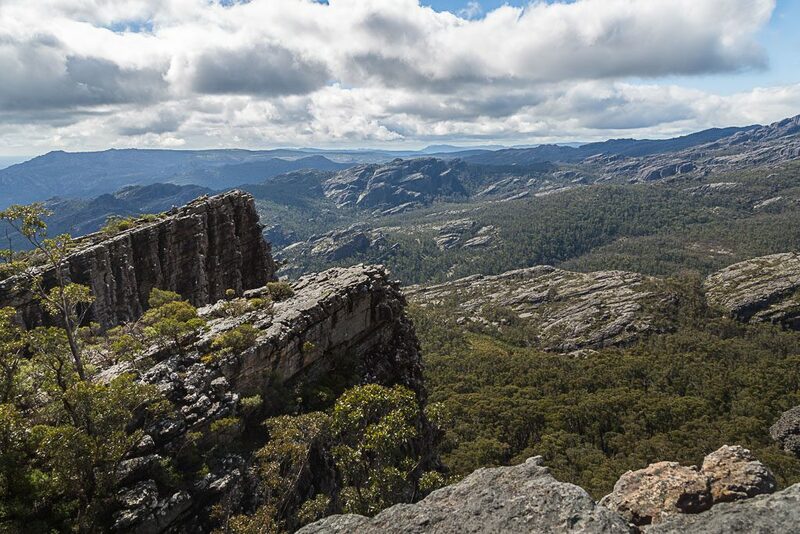 Tentatively I made it to the top of an outcrop and was rewarded with a dramatic view. From this little foray for a view, I’d learned a lesson I’d stick to for the rest of the day. 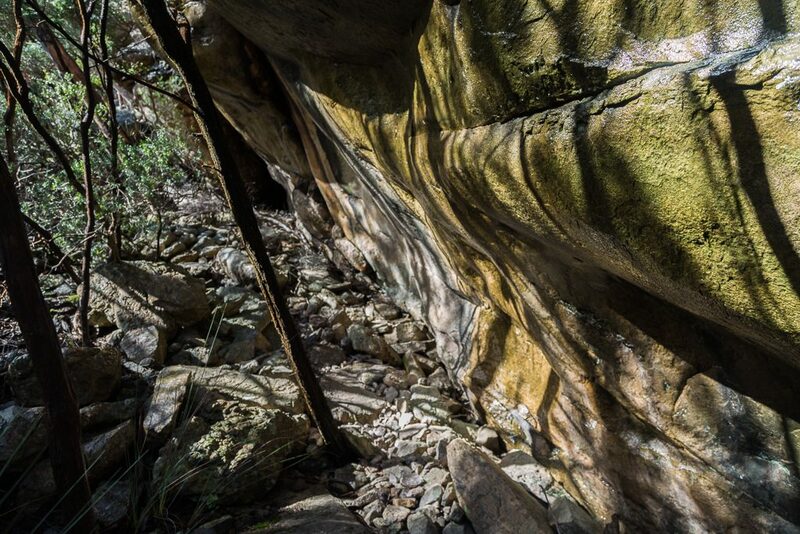 If they’re wet, don’t go climbing rocks. Walking solo always has those moments of risk assessment and I elected the safer option. …that seem as if you’re walking in a prehistoric landscape. …but there are always surprises. 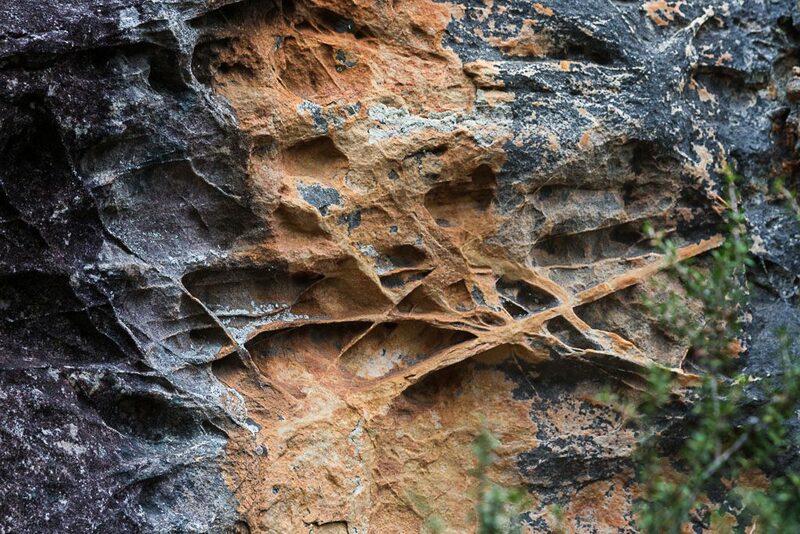 This appears more like muscle sinew than rock. As the day went on, there was one thing I’d long given up on. Trying to keep the camera lens dry. As you can see from the opening photo in this post, I’d decided to live with water drops. 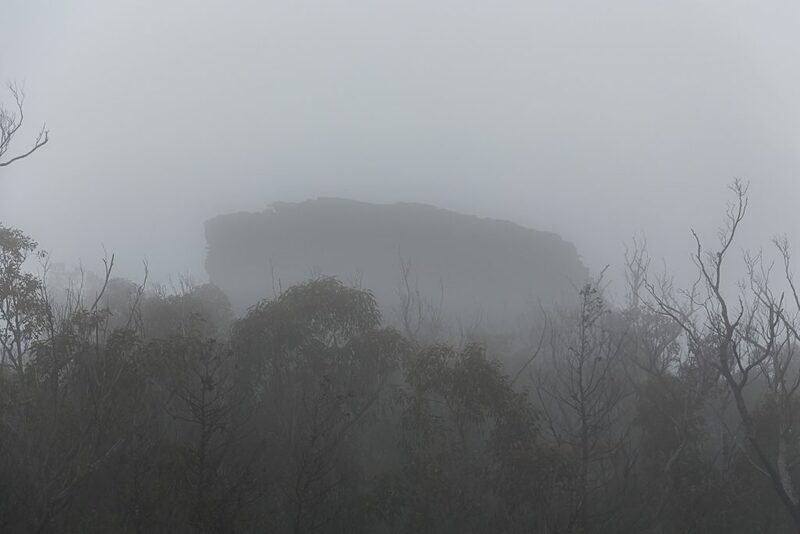 A mist would descend into heavy drizzle, leaving the camera wet. If I stopped every time the lens got wet, then I’d still be walking there now. It wasn’t all about photos of huge rocks though, as I continued to look for something smaller. 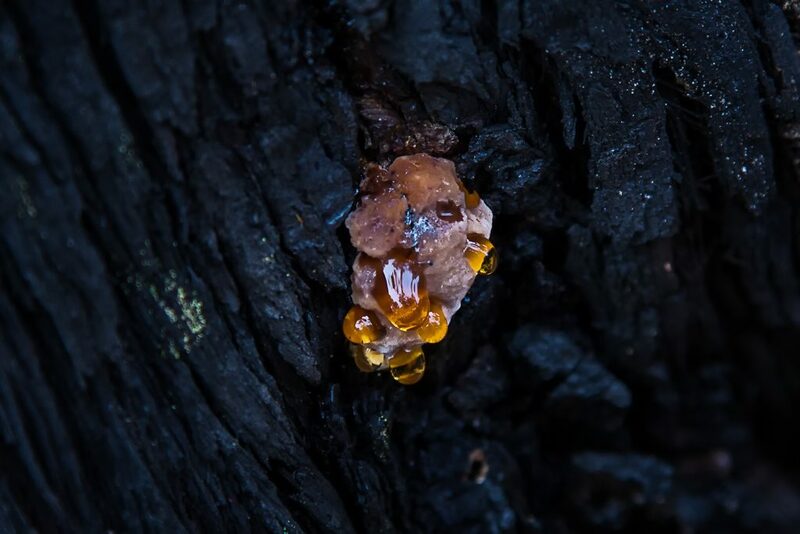 This sap on a burned tree caught my eye. Now, where was I? I’d walked a few hours and knew that a steep descent to Deep Creek was upcoming. Prior to this plummet, it was suggested to clamber up neighbouring rocks and take in a close up view of the Fortress itself. 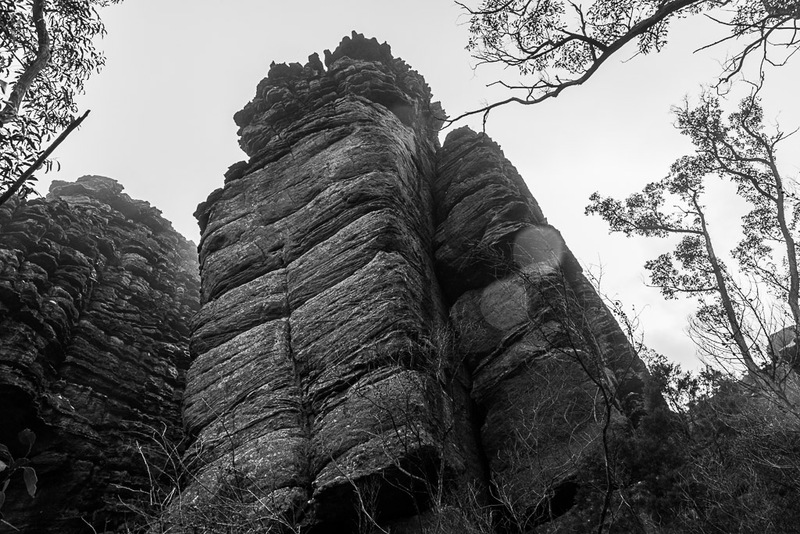 This jumble of enormous buttresses was always on my photographic radar. 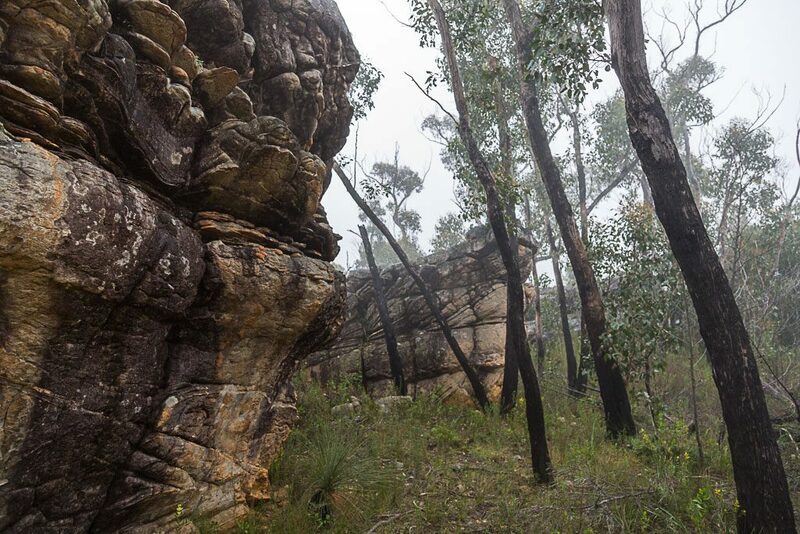 Unfortunately though the weather hadn’t changed since my previous foray onto a rock outcrop. The wet and slippery conditions meant I abandoned the thought of risking it all, just for a good photo. I actually held off writing this post, as I had an idea I’d head back up there and just do this leg as a day walk on a fine and sunny day. As per usual though, it hasn’t happened, so you’re not going to get those expansive Fortress landscapes. Maybe over summer I’ll get it done and revisit this post. Instead, as I reached the large descent, all I had were glimpses of the Fortress through the trees. …my pace shifted from slow to glacial. Everything I stood on seemed to shift, so I took extra care, as this steep descent was not the place to take a tumble. Do you think I fell over again? Unfortunately for you, but luckily for me, I managed to inch my way down in one piece until the terrain levelled off. Passing by, a small cave looked familiar. In the Chapman notes, he has a photo where there’s a tent inside it. After a cursory examination I declined the accommodation. If I attempted to sleep in there, I reckon I might get stuck and need the fire brigade to pull me out. 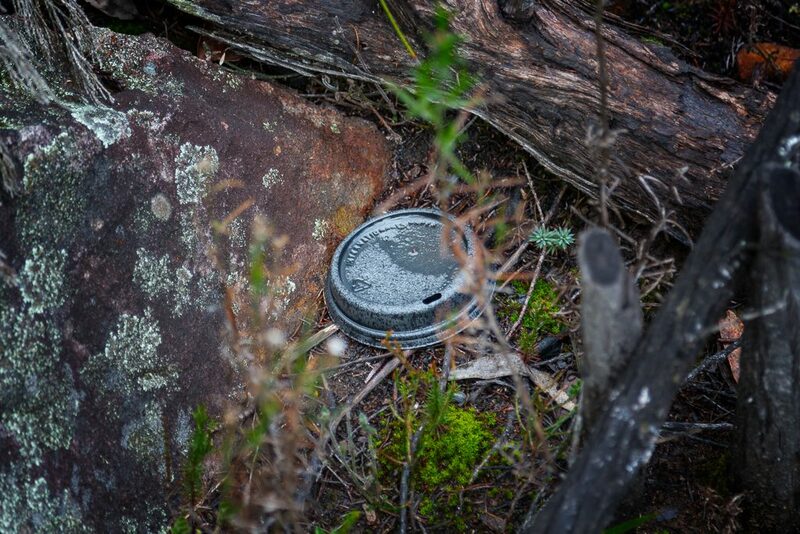 …is not the name on the map or Parks Vic website. 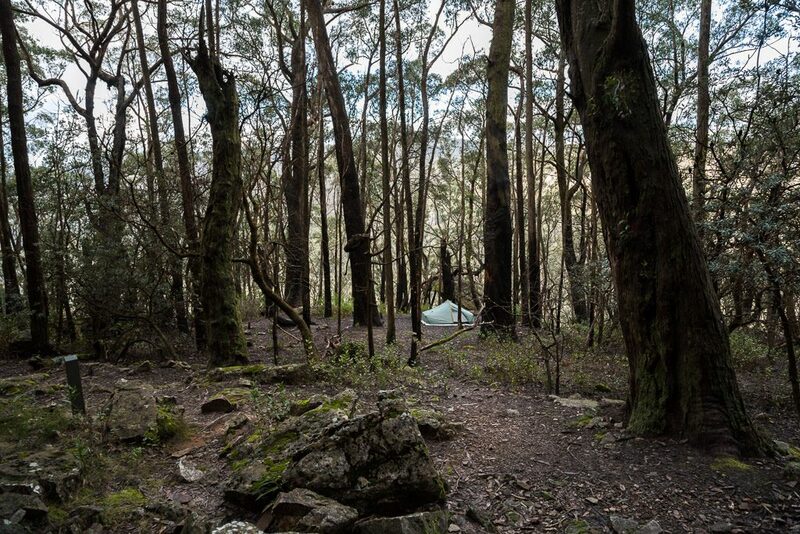 This is the Deep Creek Hiker Campsite. 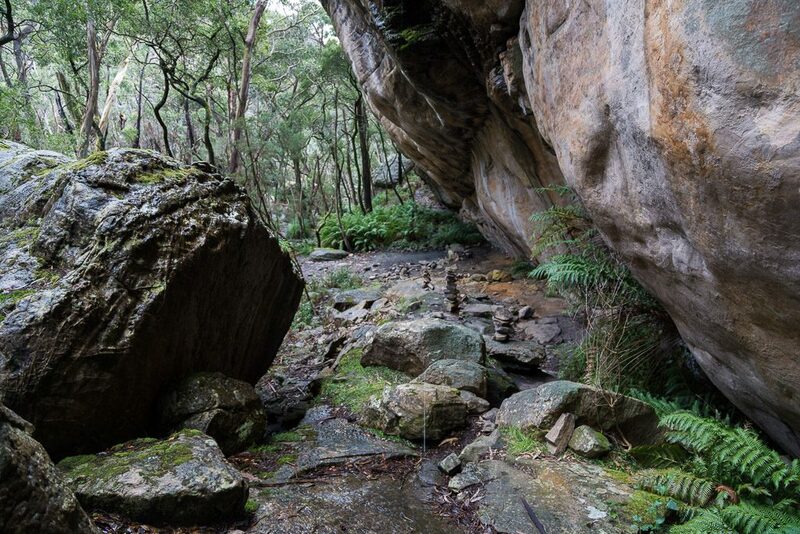 With plentiful water and rock overhangs, it looked like a good spot to stay. When no one else is around. Space seemed limited, so I’ve no idea what it’s like in summer when there are multiple visitors. I’d always intended to continue on and stop for the night at the Fortress Hiker Camp. This was a few kilometres further, but there was a slight concern. Being higher, water supply might be a problem. I figured though, in the freezing winter conditions, I wouldn’t need much to get me through until the following day. So, after a brief respite, I was moving on. 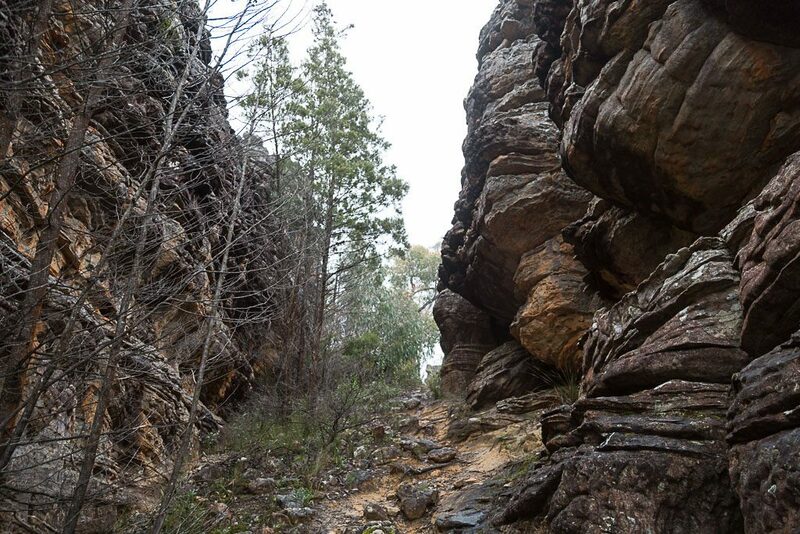 Climbing out from Deep Creek via a handy gap between some rocks. …things began to make more sense, as a more defined track continued to head uphill. Now, creeping up on me was another feeling. I felt as if I was running out of puff. By now it was early afternoon and I’d walked more or less non-stop since the start. Also, I was finding the climb away from the creek to be more taxing than anything else previous. Figuring I had more than enough time up my sleeve to make camp well and truly before dark, I decided to take an extended break. Where though? If I was going to sit down for half an hour, at least I wanted a view. Luckily, I was in the right spot. The multiple weather seasons in one day was in full swing and now the sun was shining. 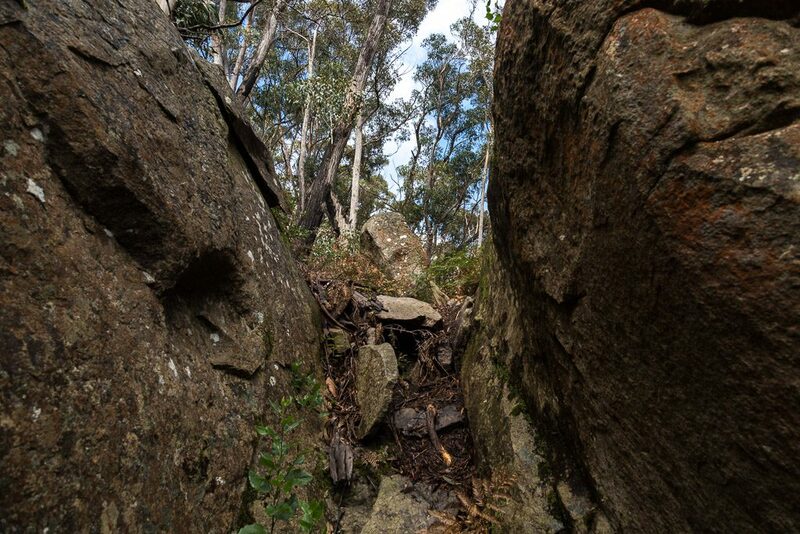 Eyeing off some rocks beside the track, I clambered up them. They were a good choice, as I’d found my resting spot. 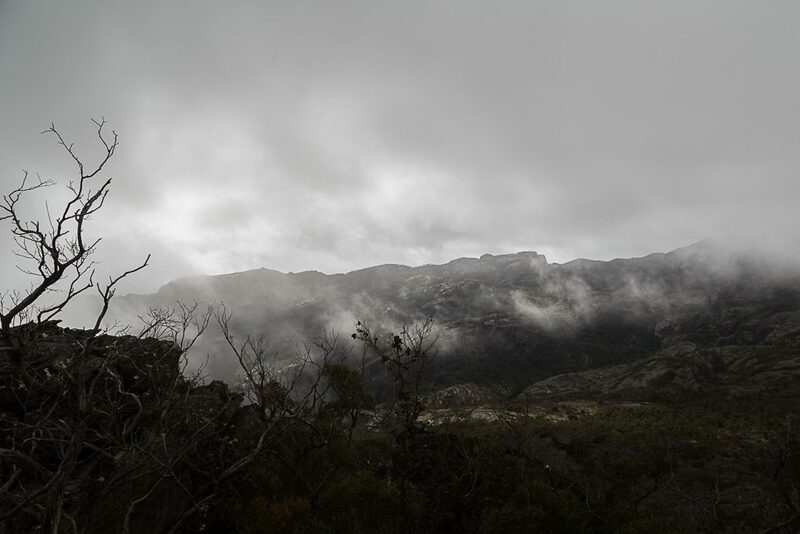 These were some of the best views all day, as the Victoria Range was no longer cloaked in cloud. Looking back at the steep ascent I’d just climbed, farmed land was visible in the distance. In the weak sunshine, I spent quite some time lying on those rocks. So much so, it was hard to get going again. 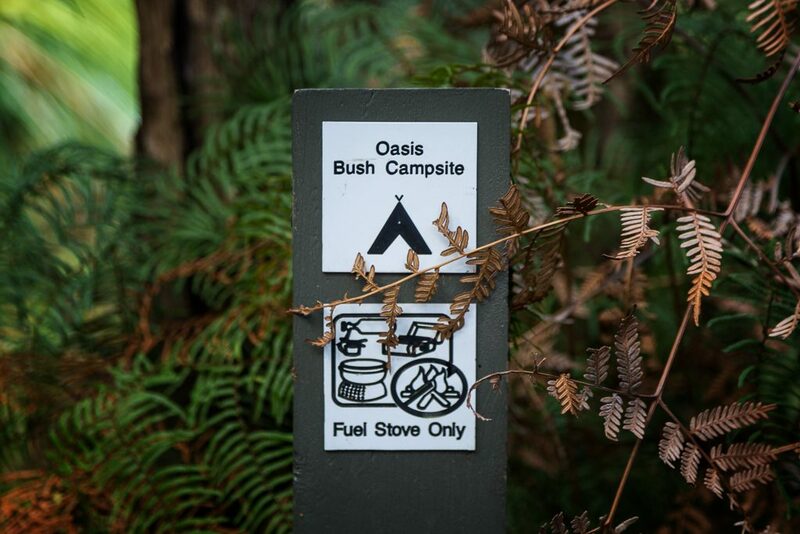 Luckily, I didn’t have far to camp, as my legs felt creaky as I began walking again. Now it was a matter of keeping the head down and reaching the Fortress caves and go through the rigmarole of setting up for the night. Keeping the head down whilst walking has some benefits. With head horizontal, I spotted this fungi. 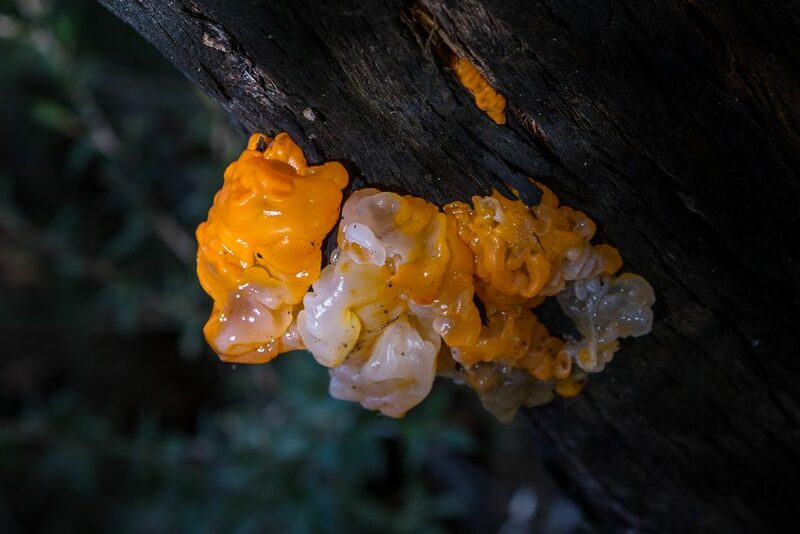 It’s either a Tremella mesenterica or a Tremella aurantia. Maybe. 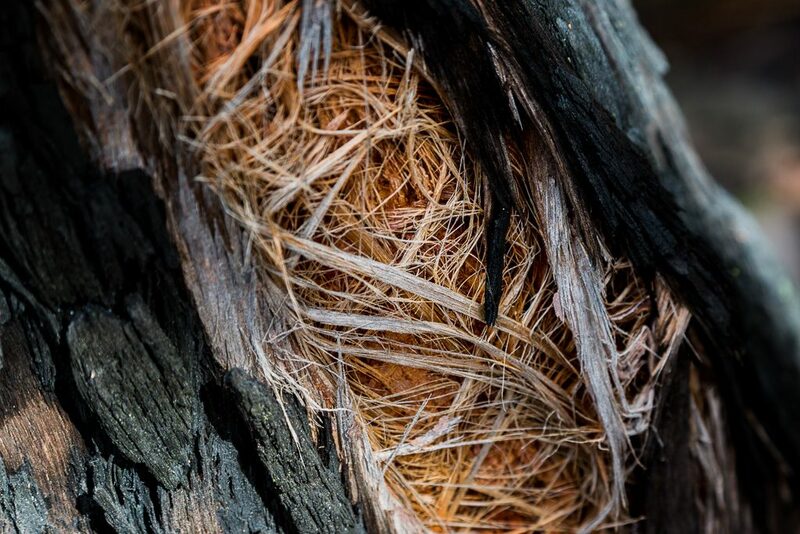 Also, what looks like woven fibres within a burned tree branch looked interesting. After some more weaving between rocks and trees, the finish line was in sight, as a sign announced I was upon the camp. What an imposing site it is as well. 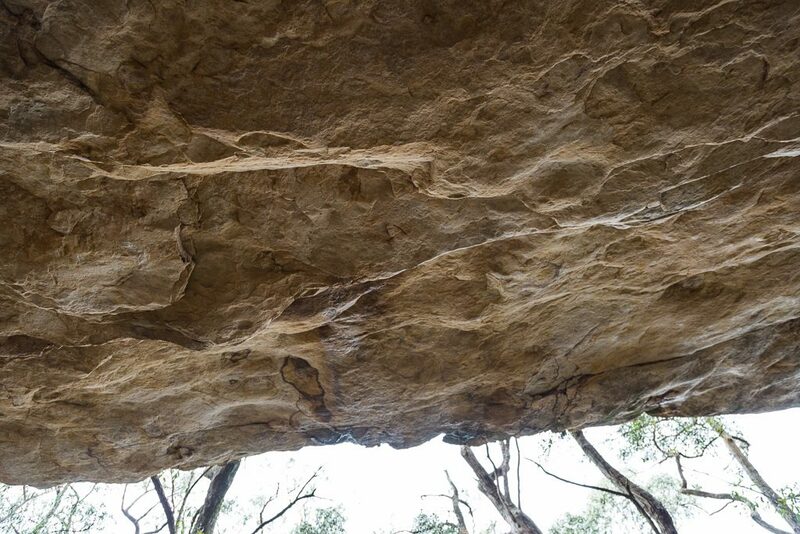 Enormous rock overhangs give shelter below and there are a few cleared areas to fit a tent into. …when suddenly I felt uncomfortable. Its hulking presence gave me a ‘Stinkin’ Big Rock of Damocles’ feeling, so I moved and ended up a short distance down the hill in a clearing. 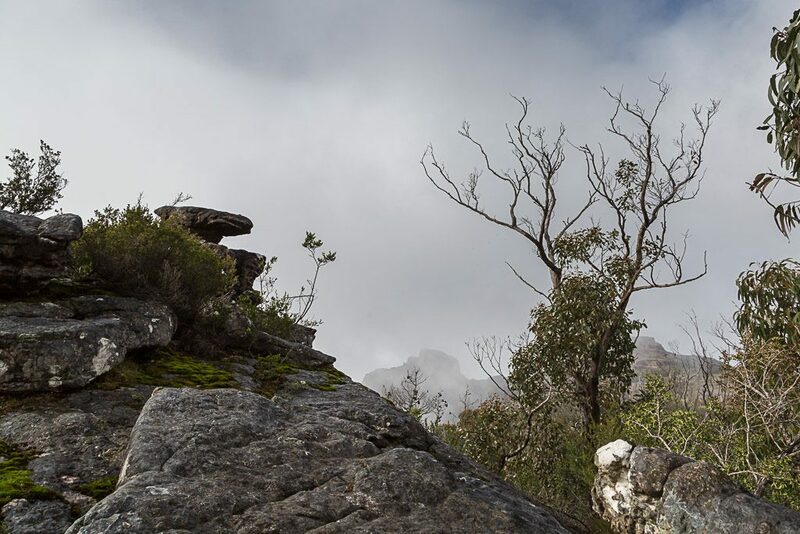 Sure, rocks that have stood for millions of years are unlikely to come down. Also, even if they did, then my final position about 50 metres away wouldn’t be any better than being right underneath. Ah, but anxieties don’t work that way and they’re often not logical. Anyway, that’s it then. A decade or so later, I made it up the Fortress and settled in for the night at 852 metres. From a wintry start, the weather had cleared and with minimal clouds in the sky, I was going to be in for a cold night. All in all, things had gone to plan. Lucky, as I’d spent the day with a booming headache due to one of the main post-Pristiq side-effects, so I wasn’t thinking too clearly if something untoward happened. Actually, I think I had a constant headache for a fortnight. If you’re into headaches, then get addicted to Pristiq and then quit. You’ll be guaranteed to have some head thumpers. Worth the wait for the action to begin, some great photography and descriptive text for us to follow your latest fiasco. I’ve just got home after a few days with a group of clients kayaking and hiking around the Winton wetlands , some great scenery and wildlife in that area although after a couple of 35 degree days I’m sunburnt and stuffed so I don’t know how you keep doing it. That ground seems harder than it did to sleep on a few years ago. Good job Greg. 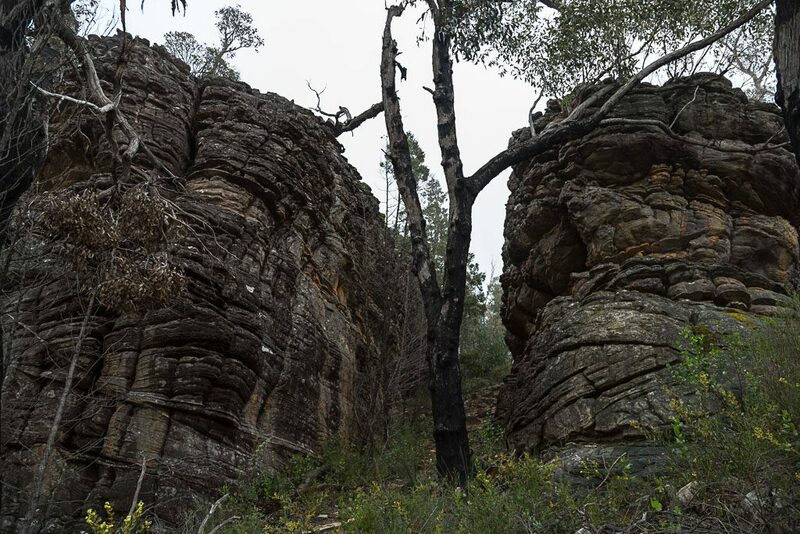 Probably wise you didn’t climb up the outcrop just before the decent to the camp, I had a feeling it was a bit dodgy off memory and you have proved again in this post that Grampian rock is a bit scetchy after rain, especially for a guy who falls on each walk he goes on. Yeah, with those boots, I found I could barely walk on flat rocks that were wet, let alone go climbing in them. If I get back up there to do it again, I’ll make sure it’s a dry, sunny day! Oh yeah, there aren’t many walks I haven’t fallen over on. This was another one! You should get rid of your Merrell Moab Ventilator boots shouldn’t you ? – they sound crap. “A cake of soap that’s been dipped in lard” doesn’t suggest the definition of a grippy sole. I have my suspicions that a Vibram sole – like YKK zippers or Gore-Tex in general – means very little in and of itself.. I just went out to the car to check my boots to see if they have Vibram soles – imagine my surprise that the 42° heat today has melted the soles clean off them. How vexing! Mind you, it was about 87.6 degrees celsius actually *inside* the car. I guess I’ll be needing some more boots – I might stay clear of Merrell Moab Ventilators though. Yeah, I tend to find Vibram is fantastic on dry stuff, but shocking on anything remotely damp. Then again, there are different varieties of Vibram sole, so I’m sure they have a stickier one out there. Just not on Merrell Moab’s 🙂 Regarding the Merrell’s. I’d happily hurl them in the bin and never use them again except for one problem. So far, they’re the only soft boot to fit me. Trying to find a size 48 in a wide fitting is way harder than I expected. I had a pair of Vasque’s that were okay, but they wore out in a matter of months. As it is, the Merrell’s I wear can’t be bought over here. They don’t stock the wides in Australia, so I have to pay a premium to get them from the States. I’m always up for shoe/boot suggestions, but for the last decade I’ve struggled to find something that combines both the wide and length. I’ve been in many a hiking store and when I detail my requirements, I generally end up with a shrug of the shoulders from the sales person! I guess melted soles would make for some grippy rock wandering shoes now…?! It’s weird, Today in the cooler weather they’ve sort of half re-bonded again.. I might see if those outdoor repair guys at Point Cook can affix them with something stronger than Clag. I see now your quandary with the Merrell Moab boots. You have fair-sized clod-hoppers – size 48 is like an AUS size 13 – that’s enormous. And Wide as well. It just seems a challenging psychological proposition to deal with – that a shower of rain could turn you from Limpid Lizard to an iceskater on any given walk. Yeah, I’ve got a pair of leather boots that I’ve had for nine years. I reckon if the sole eventually lets go, I’ll look at getting them resoled! Seems a waste to discard shoes when the sole gives way. Well, gives way, rather than fall over entirely! Hopefully those Point Cook blokes have a solution. Oh, with my shoes, certain brands are pointless. Scarpa is one. Salomon are another. Both run narrow, so I don’t even bother with them anymore. It’s been a saga for years. I’m tempted to go for a pair of runners and dispense with outdoor shoes altogether. At least I can get a wide runner.